Teen bodybuilders need the right mindset to become the strong men and women of the future. 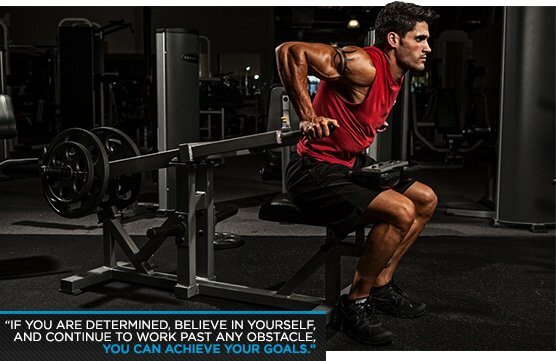 Follow these principles, and you'll stay strong and shredded no matter where life takes you! If you're a teen bodybuilder and you're passionate about training and perhaps even competing, you are extremely fortunate. Some people don't find that type of passion until they're much older—and many never find it at all. Having something that you're passionate about motivates you and gives you a focus that will enrich your life. Your ambitions in bodybuilding are probably sky-high right now, but I'll let you in on a secret: Your passion doesn't have to be something that makes you money or makes you famous in order to sustain you. It just has to be something that makes you happy and gives you a sense of satisfaction. Bodybuilding is a great passion to have, because it's all about being healthy and living a clean lifestyle. That said, I know as well as anyone that there's plenty of bad information out there. My goal is to help you know how to separate the two. I've earned my knowledge about bodybuilding and muscular development over a time period spanning longer than you've been alive. I can't think of too many things that would be more rewarding than attaining the body you want through knowledge and experience. If you were my son, this is the exact advice I would give to you. Use it wisely! If it helps, you can think of me as that "buff dad you never had." There's no hard-and-fast rule about what a mentor is, or who is qualified to be one. But after you've been through the wringer of physique transformation—especially for competition—you'll realize how important it is to have someone who shares your passion, inspires you, and pushes you to the next level. Your mentor doesn't have to be a professional or someone who competes on a national level—although they can be. They might be older, or they might be your age. They don't even have to be someone who directly coaches you, helps design your program, or maps out your nutrition—although they might. What a mentor provides is more vague—and more important in the long term. They keep you accountable. They keep your best interests at heart, and their personality motivates you. That may not sound like much, but remember: Bodybuilding is a lifestyle, more so than almost any other sport. You can get strong without support, but you won't stay strong without it. When you're new to bodybuilding and trying to learn, grow, and reach your goals, the last thing you need is to be surrounded by people who don't "get" what you're doing. Spending day after day around people who don't understand why you bother working out can bring you down and kill your motivation. The answer isn't to dump your family or friends. It's to get to know other bodybuilders in your community and at your gym. Maintain a social circle that understands what you do and why, and who can provide you with camaraderie and shared experiences. Bodybuilding is too long and difficult of a journey to do alone. It'd be great if you could just walk into the gym and find the perfect posse, but I know it doesn't happen that way. Even if you don't have bodybuilding friends in your area, you can still find community through my Facebook page, or by signing up for your own BodySpace account and getting acquainted with the the Skip La Cour - Mass Machine Bodybuilding thread on the Bodybuilding.com forum. I created the thread in the hopes of allowing people at all points of the process to hook up and communicate. And sure enough, the people who participate in the thread are incredibly supportive of each other. There are people there who can help celebrate successes and give that push to move forward. That kind of community can be important, especially for a teen bodybuilder who isn't receiving it elsewhere. There's so much information on the Internet about bodybuilding—and everything else—those of us who were around back in the pre-Net days can barely believe it. This is both good and bad. Plenty of what you see if you type in a simple question is just plain wrong. It will slow your progress, get you hurt in the short term, and damage your health in the long term. This is especially true in social media and on forums. Everybody under the sun has an opinion, and you have no way of determining if they know what they're talking about. One of the worst things you can do is post your nutrition plan or your workout routine on a forum and ask people for their input. Half of them will tell you it's awesome, and the other half will tell you it's stupid. That just leaves you confused and running from program to program, based on advice from total strangers. What's the answer? Stay skeptical and be patient. Seek out respected and responsible sources of bodybuilding information. On my website and sites like Bodybuilding.com , you can get information that is well-researched and based on solid science and years of experience. Steer clear of half-baked bro-science and be wary of opinions on Facebook, Twitter, or random forums from people you don't know. When I was just starting out, I lived in a town where I didn't know anyone in bodybuilding. I was passionate about the sport, and I decided I wanted to enter my first competition, a small local event. I trained my heart out for months and I was so pumped up and excited about seeing what I could do. Skip La Cour is a six-time national drug-free champion bodybuilder who has won 15 bodybuilding competitions in his career. His 10 books, eight top-selling DVDs and five audio seminar courses have helped thousands of people at all training levels reach their goals. His Mass Machine Bodybuilding thread on the Bodybuilidng.com has also grown into a phenomenon, with more than 8,000 posts and more than 500,000 views. 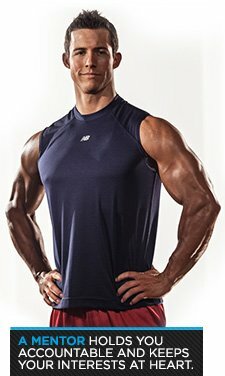 Skip also owns and operates the Mass Machine Nutrition supplement line, available through the Bodybuilding.com online store. Mass Machine Nutrition was nominated for "New Brand of the Year" in the 2012 Bodybuilding.com Supplement of the Year Awards. About two weeks before the event, a friend of mine took me aside and told me I had no chance of winning. He wasn't a bodybuilder, but he was a local, and he swore that I had no chance of winning because I was new on the scene and the judging was too political. By the time he told me this, I was already totally committed. I'd been working hard for a long time and the event was right around the corner, so his advice didn't change anything. I actually went on to win that event, but what if he had given me his "insider knowledge" when I first started training for the competition? I probably would have believed him, I probably would have quit, and I certainly wouldn't have won that event. Unlike a straight numbers game like golf, perception and judgment are part of the process in bodybuilding. Unfortunately, everyone sees the world through their own eyes. So ultimately, you have to decide for yourself what you're up for: how much humiliation or failure you're willing to risk, and how far you want to go. You may have the world's best mentor and a great community behind you, but ultimately, it's all still up to you. Listen to the advice of people who know what they're talking about. But when it doesn't sound right, research the facts yourself and make decisions based on your gut. This last piece of advice is one of the most important things I can say to you: Your mindset is everything. It means more than your metabolism, your genetics, whether you have a coach, and even what kind of gym you have access to. If you are determined, if you believe in yourself, and if you continue to work past any obstacle, you can achieve your goals. You may only stick with bodybuilding for a few years. One day—maybe sooner than you think—work, kids, and life in general may cause you to stop training. On the other hand, you may still be training hard when you're 60. Teen bodybuilders are the champions of tomorrow; with the right mental approach, you can go as far as you dream in this sport. Leave your comments below. Tell me what helps you to take your efforts to a higher level.